For some time, my wife and I have talked about making our home in Stamford more energy efficient. In 2011, we had an energy audit performed under the Connecticut Energy Efficiency Fund program, and followed up by purchasing several ENERGY STAR rated appliances. Of course, before proceeding further you will need the proper orientation for your roof, as well as clear access to the sun most of the day. 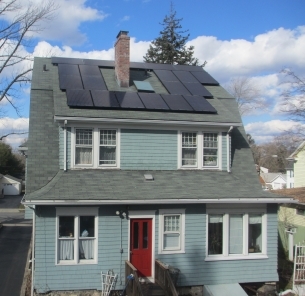 Knowing we had a south facing roof orientation, we talked about solar PV for our home but never did anything and were discouraged by an architect/friend who said that our chimney would cast too great a shadow. However, this past summer, during one of my many trips to a farmers market (in Old Greenwich), I came across a booth promoting solar PV for residential properties. “Just fill out this one page form with your address, and we will let you know if solar on your house is feasible,” I was told. With the address, satellite imagery and computerized mapping (GIS), a determination was made that solar was indeed feasible (the chimney not a problem). Several phone conversations later with an engineer somewhere in California, and I had a proposal for a 5.0 kW photovoltaic energy system on my computer. Once it was determined that a solar PV system was feasible, the financial feasibility was the next step. There are several financial packages available including outright purchase, leasing the system for 20 years, and a related Solar Power Purchase Agreement (SPPA). I originally considered a SPPA but ultimately decided to purchase the system outright with a 10-year guaranteed power output, which should cover close to 110% of my electricity usage annually. Also included was a 25-year warranty on the solar panels and micro-inverters. 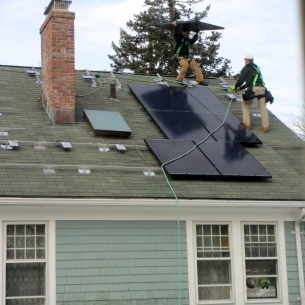 The costs become affordable, due in large part to a combination of federal tax credits and the Connecticut Energy Finance and Investment Authority (CEFIA) grant program. In my case the overall cost of my 20-panel, 5.0 kW system is slightly in excess of $21,000, but my net cost will be less than half, or around $9500. The payback period is not great, estimated at nine years. But this will vary depending on changes in electric rates. In addition, resale values for homes with solar are higher and sell faster than traditional homes, based on studies in California, which has considerable experience in residential solar PVs. After agreeing to terms, the next steps included a detailed check of my roof structure and electrical system, and the obtaining of local permit – all performed by the system provider. Everything moved quickly after that. I signed the agreement on December 21, 2012, and in less than two months the permits were obtained and the system installed. The process was relatively painless, and the solar provider did pretty much everything from preparing the specifications, obtaining the financing, to securing the permits. The actual installation (my system was considered small), took two days. And not to forget, going solar will reduce my carbon footprint! It is advisable to get more than one quote. CEFIA provides a list of approved solar companies on their web site. In the Solar Power Purchase Agreements, the solar installer provides a system at little or no cost in exchange for a long-term contract in which the homeowner pays a fixed fee for electricity generated, set at less than the customer would pay for power from the local utility. The solar price may rise at a fixed rate over the life of the agreement, which typically runs for 20 years, or by providing a small down payment, say $2,000, one can lock in the price for the agreement period.